Lord Jesus Christ, whose cross didst seal thy servant George: Grant that we, strengthened by his example and prayers, may triumph to the end over all evils, to the glory of thy Name; for with the Father and Holy Spirit thou livest and reignest, one God, for ever and ever. Amen. Lord Jesus Christ, whose cross did seal your servant George: Grant that we, strengthened by his example and prayers, may triumph to the end over all evils, to the glory of your Name; for with the Father and Holy Spirit you live and reign, one God, for ever and ever. Amen. George is a soldier and martyr who suffered around 303 at Lydda (Diospolis) in Palestine. The earliest surviving record of him is a church inscription in Syria, dated about 346. Commemorations of him are numerous, early, and widespread. However, no details of his life are known. In 495 his name appears on a list of "good men, justly remembered, whose good deeds are known only to God." The best-known story about him is that he rescued a beautiful princess in Libya by killing a dragon. It should be noted that this story is unknown before the appearance in 1265 of a romance called the Golden Legend (Legendum Aureum), translated into English in 1483. When the soldiers of the First Crusade were besieging Antioch in 1098, they had a vision of George and Demetrius (a deacon of Sirmium in Serbia, martyred under Maximian, and referred to as a "soldier of Christ," from which he was often understood to be a literal soldier) encouraging them to maintain the siege, which ultimately proved successful. Richard I ("the Lion-Heart") of England, who fought in the Holy Land in 1191-1192, placed himself and his army under George's protection, and with the return home of the Crusaders, the popularity of George in England increased greatly. Edward III founded the Order of the Garter in 1348 under his patronage, his banner (a red cross on a white field) began to be used as the English national flag in 1284, and in 1415 Henry V spoke of him to rally the troops before the battle of Agincourt ("Once more unto the breach, dear friends, once more, or close the wall up with our English dead. 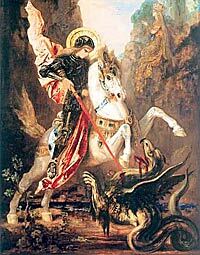 ... cry God for Harry, England, and St George! "), and in the years following George was regarded as the special patron of England, of soldiers, and of the Boy Scouts, as well as of Venice, Genoa, Portugal, and Catalonia. He is also remembered with enthusiasm in many parts of the East Orthodox Church. He is a principal character in Edmund Spenser's allegorical poem The Faerie Queene, written in the late 1500's.